I was reading about this lobster festival in Rockland, Maine that happens every August. I put it on my list of random things I want to do. 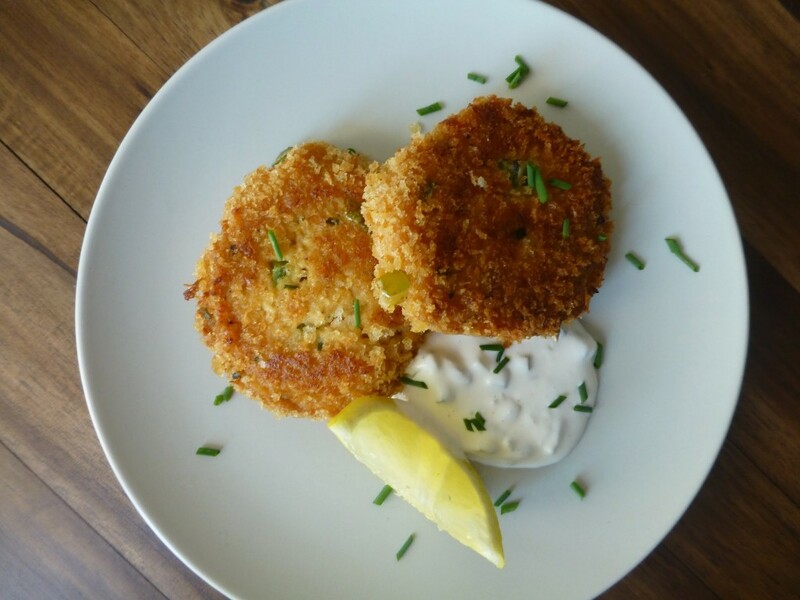 In the meantime, I traveled vicariously by doing a google maps street view tour and making some crab cakes with tartar sauce. I know it’s not lobster, but that’s a story and recipe for another day. You can make the same bad joke about tartar as you can about couscous, “So good they named it twice.” Only in this case if they didn’t name it twice, it’d be tar… You know the sad thing is that after the BP spill, “crab cakes with tar” might’ve been fitting. Poor crabs. This recipe’s a little more complicated then it needs to be. The key ingredients for tartar are mayo + minced pickles, followed by lemon. The rest is more if-you-have-it-toss-it-in stuff. 1. Combine all ingredients together and then refrigerate a few hours. 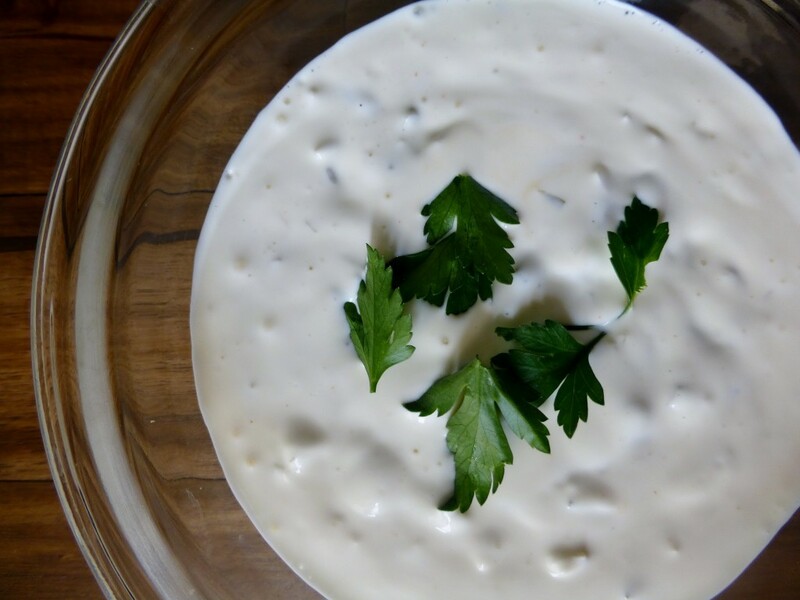 You want to make you tartar sauce first, so the flavors can combine. 1. Mix together everything, except the crab and the vegetable oil (that’s for pan frying them).Then add in the crab. Don’t mix the crab meat too much, or it’ll smoosh and you’ll lose some of that texture. 2. 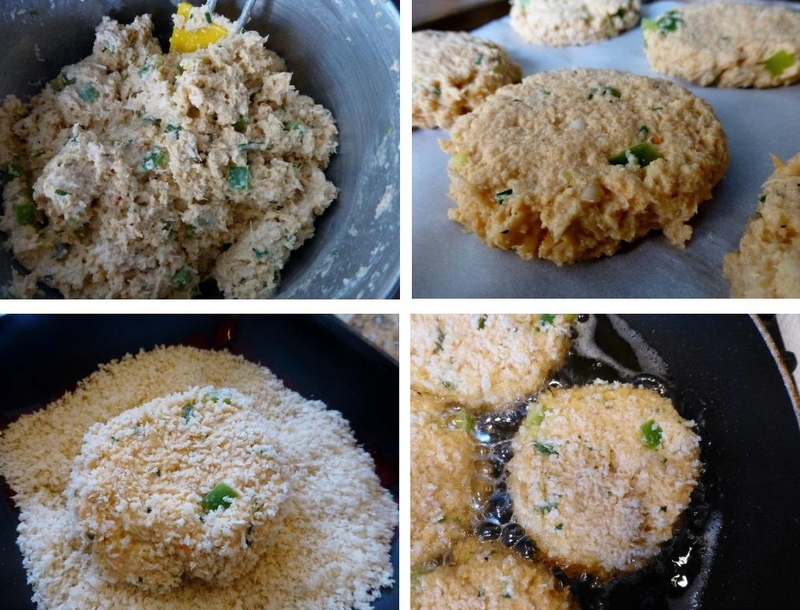 Form the crab cakes into patties. I use an ice cream scoop and then flatten them with my palm. Place on a parchment line baking tray and refrigerate for 30-45 min (or freeze for no more than 15 min). 3. Pour some additional panko crumbs into a dish. 4. 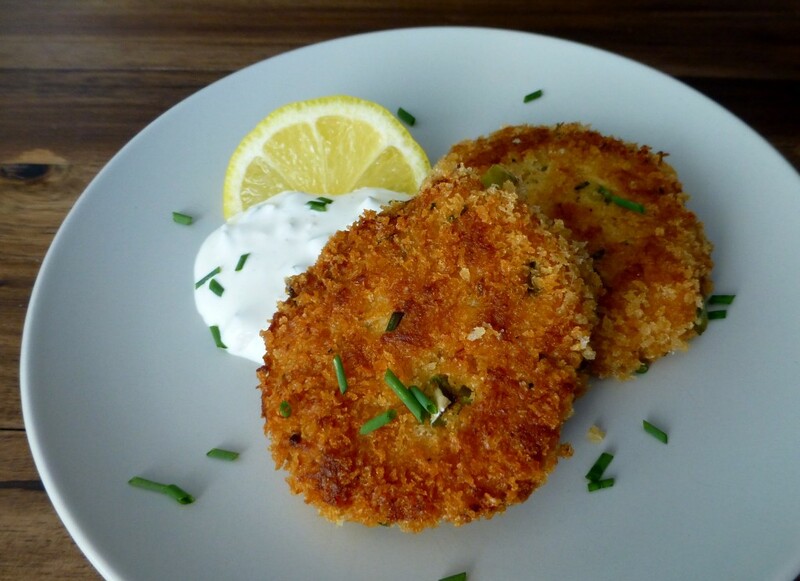 Take out the crab cakes from the fridge, and carefully dip the patties in the crumbs on both sides. The crab cakes are pretty delicate. Refrigerating helps them firm up a bit, and the parchment absorbs some moisture, so they’re a little easier to handle. 5. Heat the oil in the pan. 6. Add in the crab cakes. You might have to do it in two batches. Cook for a about 3-4 minutes on each side until browned. 7. Transfer to some paper towels to absorb the oil and then serve with the tartar and a lemon wedge.